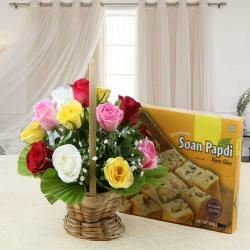 Product Consists: 50 Pink Roses in cellophane wrapping Bunch along with Kaju Katli Box (Weight - 500 Gm). This gift combo contains a super hamper in addition to special ones. This combo will be the perfect bet for surprising your loved ones on almost any occasion including Diwali, Valentines Day, weddings and anniversaries alike. The gift adds just the right dose of cuteness to this combo. This gift combo should definitely be on your shopping list ahead of the festive season. 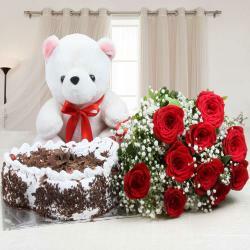 This is popular choice is the perfect gift for all these occasions like Birthday, Anniversary, Wedding, Pongal, Ganesh Chaturthi, Father's Day and more. 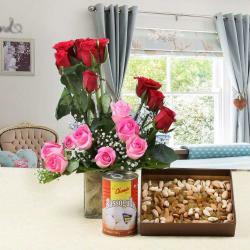 Product Consists: 50 Pink Roses in cellophane wrapping Bunch along with Kaju Katli Box (Weight - 500 Gm).